BAR HARBOR — Friends of Acadia will be hold it’s first-ever Community Outdoor Gear Sale and Swap on Saturday, May 18, at Mount Desert Island High School in Bar Harbor from 10 a.m. until 2 p.m. The event is designed for those who want to thin out their stash of outdoor equipment and/or sporting goods as well as those looking to pick up bargains or upgrades their own gear. There is no charge for a booth space and no charge for admission. Sellers set their own prices, negotiate with buyers, and keep all proceeds. “With the arrival of warmer weather we just thought this would be a great way to celebrate the area’s outdoor heritage, encourage folks to get themselves and their children outside, and help people save money and recycle unused or unwanted items,” explains FOA Communications Director Earl Brechlin. Among the types of gear that can be included in the event are new or used camping and outdoor adventure goods, tents, sleeping bags, backpacks, skis, snowshoes, optics, fishing and boating items, bicycles and accessories, electronics, optics clothing, organized sports (team or individual) items such as baseball, football, basketball and soccer equipment and clothing. There will be an indoor area for larger items such as canoes and kayaks. No firearms, liquid fuels, common household items, or collectables will be allowed. MDI High School rules prohibit all dogs from the property. 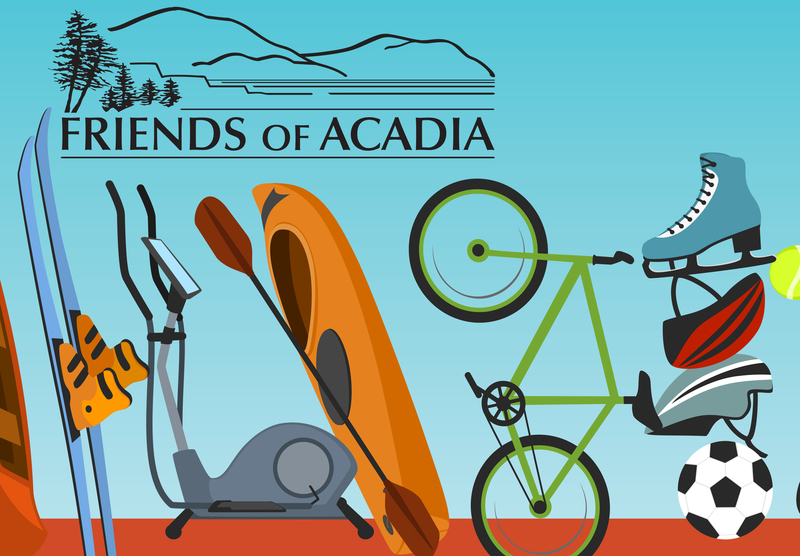 Friends of Acadia will also have information about becoming a member and a table where attendees can learn more about opportunities to volunteer including on trails in Acadia National Park. Ten by ten-foot indoor booth spaces and double spaces are available in the gym. Those wishing to sell larger items such as boats on trailers, snowmobiles, ATVs etc., can reserve a parking space outside. Setup will be from 8 a.m. until 10 a.m.
All those wishing to sell must register in advance by signing up online at www.friendsofacadia.org/gear-sale, or emailing gear@friendsofacadia.org. For more information call 288-3340. Those interested in volunteering at the sale please use the same email address and phone number. Friends of Acadia preserves, protects, and promotes stewardship of the outstanding natural beauty, ecological vitality, and distinctive cultural resources of Acadia National Park and surrounding communities for the inspiration and enjoyment of current and future generations. Visit www.friendsofacadia.org.